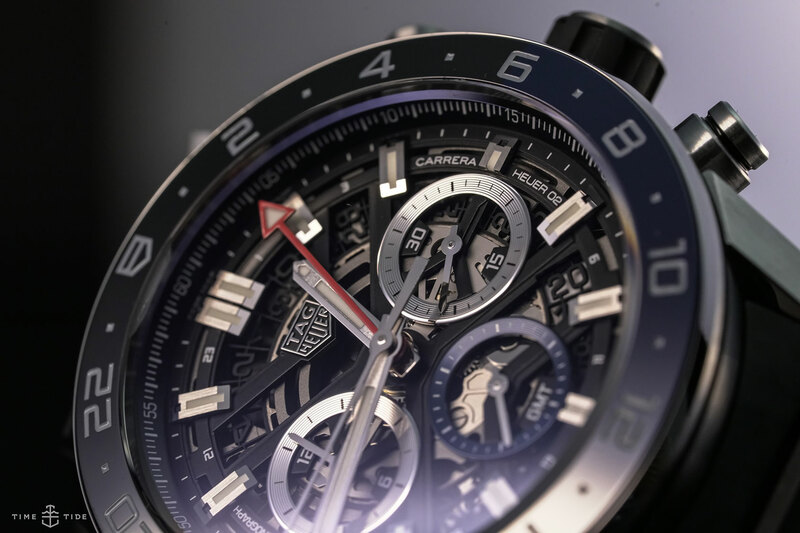 This year marks 55 years of the Carrera, and TAG Heuer are pulling no punches when it comes to celebrating the occasion. 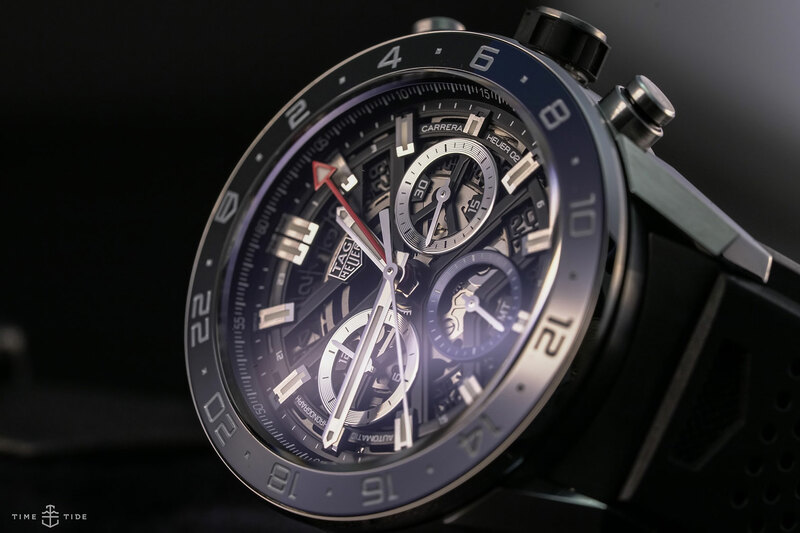 Releasing a sporty selection of models at Baselworld 2018, which includes watches like this one — their modern take on the Carrera but with their latest in-house movement now sporting a GMT function inside. Last year we saw TAG Heuer downsize the skeletonised Carreras to 43mm, but this new GMT beefs things up again with a 45mm steel case. 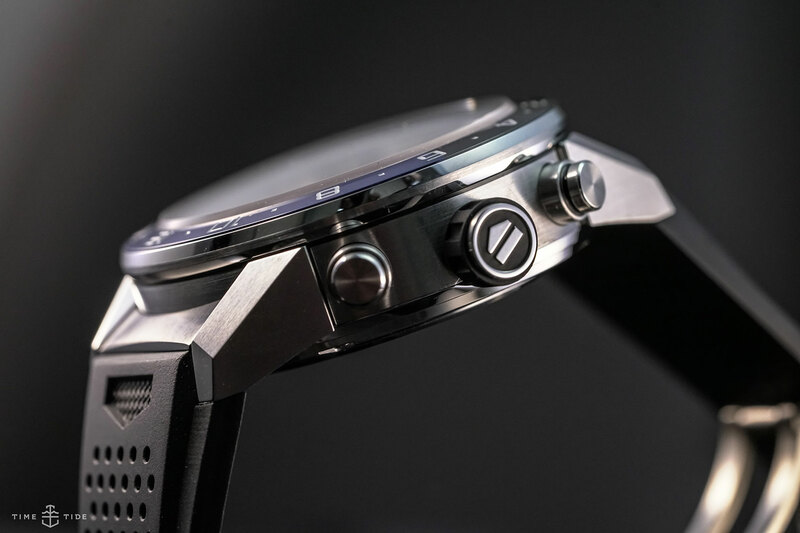 Maintaining a water resistance of 100m as well as the option of a stainless-steel bracelet or black rubber strap. The biggest change is the addition of a GMT complication to the new 75-hour Heuer 02 movement inside. The layout of the hands is a little different than normal as well, with the GMT hand sitting between the hour and minute hands so that it sweeps over the bold hour markers of the skeletonised dial. And for the first time there’s also a dual colour ceramic bezel in black and blue with a 24-hour scale for GMT functionality. It’s a lightshow. With light bouncing around the dial, from the polished hands and indices, to the concentrically ridged rings of the subdials. 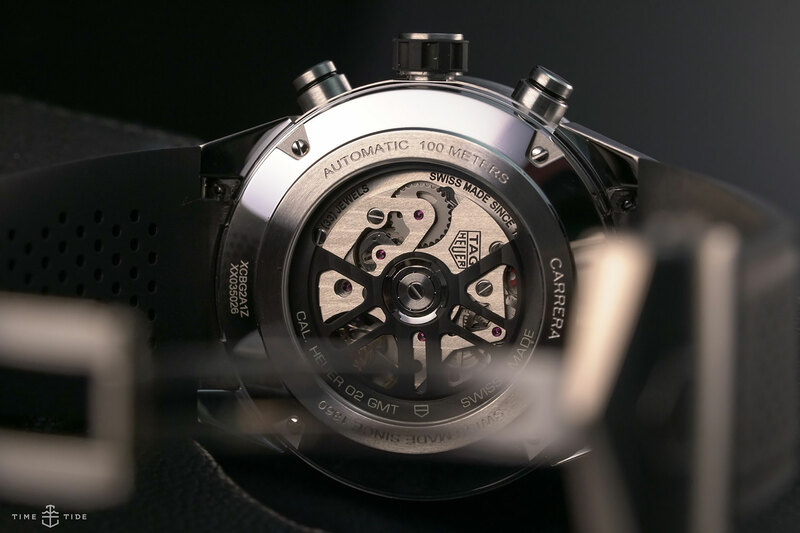 And while at-a-glance readability may not be this Carrera’s strongest attribute, the red GMT hand does pop against the openworked dial, and I, for one, didn’t mind letting my eyes linger for just a few seconds more. Certainly not for everyone, but how boring the world would be if we all liked the same things. If you’re after something sporty and live a jet-set life then this one is for you. Or maybe you’d just like an in-house integrated chronograph with an added GMT complication. I think how instantly smitten I was with this one. I’ll be honest and say that the previous Carrera Heuer 01s never much appealed to me. But the story has changed now with the Heuer 02 and its 3, 6, 9 dial layout … and adding a GMT complication is just icing on the cake.